Fundic gland polyps (FGPs) are generally considered benign. 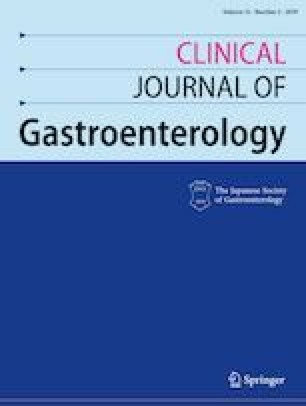 Proton-pump inhibitors (PPIs) are used worldwide as first-line therapy for gastroesophageal reflux disease and nonsteroidal anti-inflammatory drug-induced ulcer treatment. Long-term use of PPIs increases the risk of FGP development. We report an extremely rare case of PPI-induced FGPs with hematemesis. A 37-year-old woman taking daily rabeprazole presented to the hospital with a complaint of hematemesis and tarry stools. Esophagogastroduodenoscopy (EGD) revealed > 20 pedunculated polyps in the gastric body and fundus. Histological examination showed multiple fragments of fundic gland mucosa with dilated glands. Based on these findings and the clinical history, FGPs were diagnosed. Rabeprazole use was discontinued. Repeat EGD performed 9 months later showed a significant decrease in the number and size of the polyps. FGPs are small polyps typically located in the gastric corpus and fundus. They are commonly reported in patients in their 60s and predominantly in females. We conclude that PPI use is a risk factor for the development of FGPs and hematemesis. Mamoru Tanaka was the major contributor in writing the manuscript; Hiromi Kataoka was involved in drafting, writing and editing the manuscript, and reviewed the manuscript as corresponding author; Takashi Yagi and Takashi Joh edited the manuscript; all authors read and approved the final manuscript. Informed written consent was obtained from the patient at the time of the endoscopic procedure. All data generated or analyzed during this study are included in this published article (Additional file 1).